PUBLISHER: Relevant audiobook version produced by Clipper Audio. In one of the most universally loved and admired English novels, a country squire of no great means must marry off his five vivacious daughters. Jane Austen's art transformed this effervescent tale of rural romance into a witty, shrewdly observed satire of English country life. A selection of the Common Core State Standards Initiative.. It may be a predictable choice, but P&P really is my favourite Austen. I love most of her books (Emma, particularly), but those I enjoy mainly for reasons other than the romance. I love them for the characterisation and the comedy and the insight into how that particular level of society worked at the time. P&P has all that, but it also has a romance that I find truly romantic. I hadn't reread it for a while, so I got myself one of the audiobook versions from my library. I wanted the Juliet Stevenson version, since her versions of Emma and Northanger Abbey have been so brilliant, but my library system seems to have lost the CDs. I then opted for the Emilia Fox version. It wasn't as great as Stevenson has been, but pretty damn good. Her Mrs. Bennett is particularly hilarious, and she does a great Mr. Collins -he positively oozes. - As with Emma and Northanger Abbey, I had very distinct memories of particular episodes. The memories themselves were pretty accurate, but I had a very distorted sense of when they occurred in the story. For instance, I was sure Mr. Darcy's proposal took place before Mr. Collins's. It didn't, and that change in the context does change the significance somewhat. - Speaking of the famous Darcy proposal, I'd forgot that we don't get it verbatim. Rather, we're told the gist of what he said. Strangely, this doesn't make that scene any less powerful. It's a bit like with horror and not showing the monster directly: my mind was quite ready to fill in the condescension and offensiveness. - The romantic, even sexual, tension between Elizabeth and Mr. Darcy fairly crackles. There isn't anything explicit here, not even one touch or unchaste thought, but Austen still makes it very clear they really, really fancy each other. - She also makes it abundantly clear why they fit each other so perfectly, and how even their respective character imperfections are what make them so compatible. - Characters who, in another author's hands might have been cartoonish (Mrs. Bennett, Mr. Collins, Lady Catherine, even Lydia) feel real. That's because there a big dollop of truth right in the centre of each. I've known people who are like each of them in their essence. They just don't take those character traits quite as far. 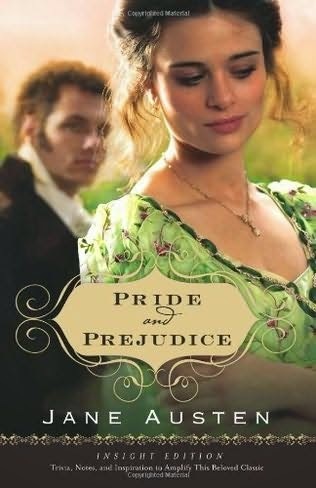 - Jane is probably the least effective character, in that I suspect my perceptions of her weren't quite as Austen intended her to be seen. I found her determination not to think badly about anyone ever quite exasperating, rather than kind and admirable. True, Elizabeth does joke a little bit about it, but with more fondness than I felt for her. Well, Jane isn't my sister, after all! - How did I forget that fabulous scene near the end where Lady Catherine tries to browbeat Elizabeth into promising never to accept Mr. Darcy? This, THIS is why Elizabeth Bennett is such a beloved character. She refuses to be bullied and, quite properly and politely, tells Lady Catherine exactly where she can go. I was cheering out loud! - Austen does like a protracted ending. It's not as effective as it might have been, and the story kind of fizzles out (just a little bit, it's not as bad as, say, Emma). On the whole, any criticism is very minor. I loved this. You know - it's odd. For all the reading I've done over the years, I've read very few of the classics including this one. I think the biggest name classic I read was Wuthering Heights. I've also read a lot of Mary Stewart, Georgette Heyer and Daphne DuMaurier - but not sure if they would be considered classics or not. Kristie: If you ever feel like reading some classics, I highly recommend trying them in audio. Having someone really good (and for classics, the narrators usually are) reading them adds so much, and it makes any difficulty with the writing style much less.